I don't know: Is this a card, which we already have information about? Kaplan page of staves ????? I don't see this precise card in either vol. 1 or vol. 2 of Kaplan. 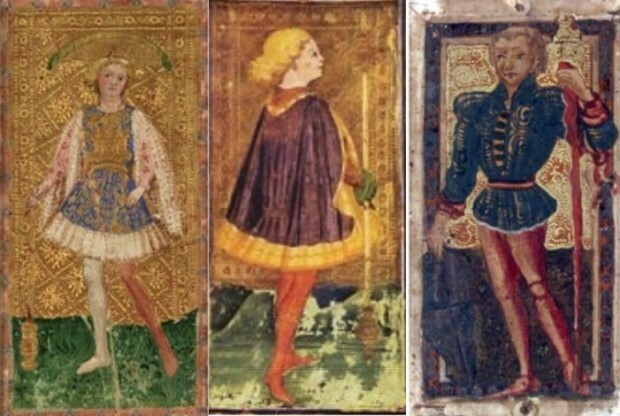 It is also not identical to the Carrara (Bergamo) page of staves, of which I once made a poor scan, from Dummett's Visconti-Sforza Tarot Cards, the middle card at http://2.bp.blogspot.com/_5e7P4Y3Wo3w/S ... d'Este.jpg. The right border of the Yale card gets lighter at much the same place as the Bergamo card does. That suggests to me that the Carrara (Bergamo) has also been retouched, as in fact was suggested by Monika Dachs in 1992. She suggested that the Papessa, Tempo, Giustizia, and Fante de Denari were retouched as well, in their robes (according to Sandrina Bandera's sentence summarizing Dachs in the Brera's 2013 "Tarocchi di Bembo" exhibition catalog, p. 52). It would be good to get a copy of Dachs, Huck. I can't: Monika Dachs, Antonio Cicognara als "Restaurator": Die Uberarbeitung der Colleoni-Tarocchi aus dem Atelier der Cremoniser Malerfamilie Bembo, in Pantheon, L, 176-178. I think her position is that Cicognara did the touching up of the PMB, as it is similar in style to that of the "6 added cards." Somehow this PMB "clone" seems to have started being retouched, following the PMB version as its model but for some reason left unfinished. However the Yale's retouching is more complete, even if it seems to follow the Bergamo's change of color at the right edge. It is as though there were a horizontal line dividing the two halves. And the Yale card's coloration reminds me of that of the Fournier Papessa's, almost black. Thanks for the link to this interesting card. It seems to be the same card. Thanks for the link. At that time I didn't realize that there were two sections for tarot history on Aeclectic. (Even now, I forget.) Now I know what you are talking about. For others similarly ignorant, the thread starts at http://www.tarotforum.net/showthread.php?t=76033. The auction description is particularly interesting, for its theory about the damage and who painted it when. 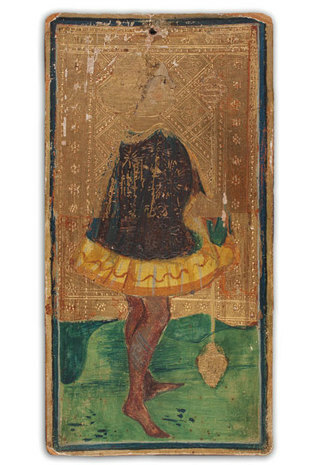 It suggests that the card is by Bembo and earlier than the PMB cards, reflecting an unsuccessful method of applying the paint. But why only half the card? Perhaps it was an experiment, half of the card painted one way and half another. If so, then whoever painted the PMB cards mistook the difference in color on the right border as something intentional and copied it. If so, then the PMB cards--at least some of them, such as the Page of Staves--wouldn't have been done by the same artist as the earlier card, although done in the same workshop. Well, I don't know what to think. Triumphal chariot of the vices in a festival book for a festival made for the birth of a daughter (1596). The playing cards at the horse attracted me. Totally 18 disguised persons presented this part of the show. ... a lot of pictures (totally 165 figures). 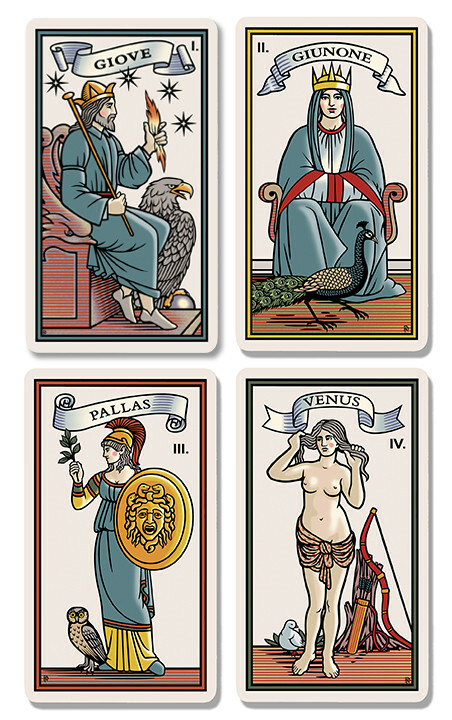 "Given the 6 triumphs of Petrarch, how could they be expanded up to the 22 ones of the tarot pack?" Well everybody would recognize the card Justice in the PMB as Justice, not as fame ... at least at first sight. But the problem of the first 14 trumps is, that Justice is the only one virtue in this deck, no other is present. That's a sort of contradiction. The second artist later added 6 virtues, but some of the virtues were transformed. Prudentia is hidden behind world. Sun-Moon-Star replace the 3 theological virtues. Michael J. Hurst has once done a great work to collect pictures of the Petrarca Trionfi at wikipedia. This makes it easy to look for anything, which connects Fame to Justice (or, what makes Fame look like Justice). It's there, but it's not one of the common motifs. Which doesn't mean much, as there were a lot of variations for Fame. Attributed to Domenico di Zanobi. - Scanned from Virtù d'amore. Pittura nuziale nel Quattrocento fiorentino." "Illustration of Petrarch's Triumph of Fame, oddly depicted as Justice with sword and scales. The artist is unknown. - Scanned from Von Bartsch: The Illustrated Bartsch, v.24." ... I found also the other 5 pictures of the series. I don't know, if this all goes back to Michael J. Hurst, anyway I observed earlier, that he was working on this. Maybe he found some followers, and that's very good. Another larger group shows Fame victorious against death. Another Fame with 2 trumpets. A good part are single motifs, which don't belong to a category. So 2 of 35 might be not so bad for "Justice as Fame". I had luck and could identify "Spendio" as "Spendios" https://fr.wikipedia.org/wiki/Spendios and thereby repair "Ethio" as "Matho" or "Mathos" https://fr.wikipedia.org/wiki/Mathos , both active in the first Punic war (both captives of Fame). Herkules and Caesar are clear, for "Ator" I can only suspect the Egyptian god with this name. As the Punic war had been a fight between Europe and Africa, and Caesar had been in Egypt, indicating another war between Europe and Africa, and Asia - Europe - Africa are otherwise given as a theme of the picture, Ator might be a plausible solution. The true political aim might be a new crusade, likely not against Africa, but against the Ottomans, the place, where one could gain the highest fame. The two rulers might be the contemporary pope and emperor ... or whoever. Aiolus (god of the winds) was a standard attribute to Fame, cause one needs some air to blow the trumpet. The elephants are another standard attribute. The castle (perhaps Jerusalem ?) is somehow also indicated at the Cary-Yale Fame. A column was produced in 1452, when the emperor Fredrick III visited Italy and married. The form of the island with tree and cliffs remembers me on PMB and Sforza heraldry, strange enough. But generally I would assume, that the work is of a later date. ... as a presentation of Fame, at least, if one assumes, that after so much talking the 5x14-theory has something to say. Well, the theme is opened. The 5x14-deck lies between 6 motifs (Petrarca's poem) and 22 motifs (Tarocchi pack), so it doesn't give a complete answer to the question. Naturally. 2. Fame holds justice's attribute, so this is merely moralizing in how Fame will treat her petitioners (reinforced with the two bound figures below the chariot). 3. The most significant aspect of the petitioning triumphators bringing up the rear is that there are 3 (in MacBeth, Shakespeare gives this number over to the 3 witches who tell the fortunes to MacBeth and Banquo - and the first word out of the first two witches is "thrice"). The prophet closest to them is obviously holding a book of the future, of what will be. The second-most important attribute of the triumphators is that their headdress features dragons - which also points to Time. Returning to Shakespeare, who evidently understood this theme all too well, he has his Third Witch describe the contents of their cauldron firstly with this: 'Scale of dragon...'. The point is not being made by either artist, but its not difficult to see how the virtue of Prudence - who is often depicted as holding a serpent and triple-faced (sometimes the third face - the future - is indicated by the mirror) could be conflated with Fame, just as the attribute of Justice is here. Fame, which endures through time, is naturally associated with Time's attributes, of which Prudence was also associated (and why else is Fame wearing a polygonal halo of a virtue if not an attribute borrowed from one of them? 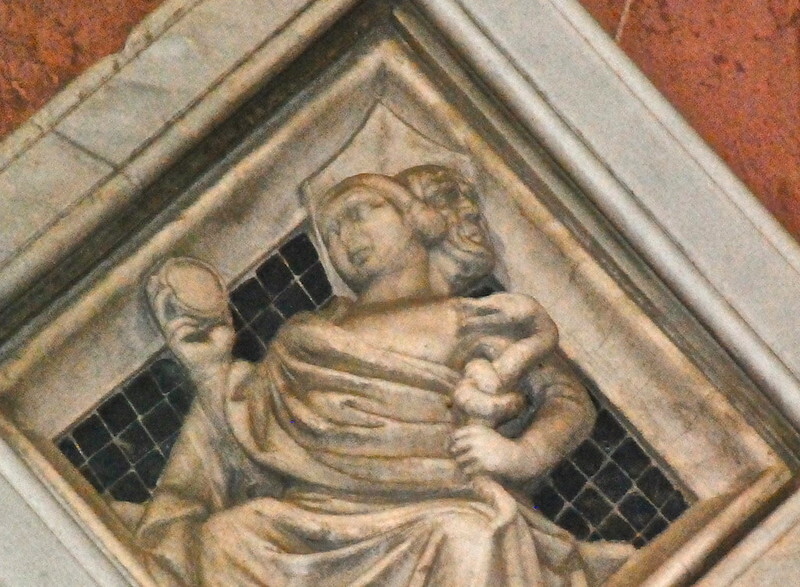 Particularly in a moralizing engraving such as the one above - as it was Prudence that Bruni hailed as the guiding virtue of the Florentines, thus allowing one 'good fama'). Also the middle triumphator's headress is winged but otherwise not dragon-like as the other two are (perhaps more papal or even imperial - either or both would confirm a ruler) - he also most directly confronts the viewer. Meanwhile the other two dragon features look backwards, as if to the future that comes after them (and those would challenge them) .